Why train Community Health Workers? The roles of Community Health Workers are tailored to the communities that they serve. Generally, CHWs promote access to services, provide health education, support care delivery, and promote advocacy. Since CHWs are typically community members, they have strong community connections and greater opportunities to build relationships and extend the reach of healthcare services. Research consistently demonstrates that CHWs increase care outcomes and quality of care in rural populations. The training and retention of CHWs is essential for improving healthcare for rural Montanans. 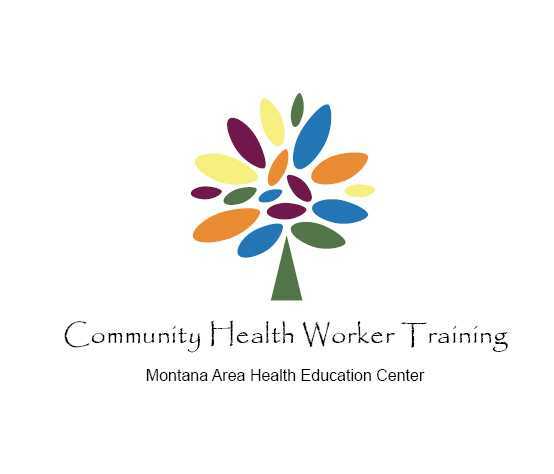 The Montana Community Health Worker (CHW) Fundamentals training provides the knowledge and skills necessary to become a Community Health Worker. The instructor-guided curriculum takes approximately seven weeks (85 hours) to complete and consists of four 15-hour Learning Modules and a 25-hour on-the-job Supervised Experience taken at the completion of the four Modules. Each Module contains written content, videos, application activities, case studies and reflective journaling. An individual will gain skills in the following areas: professional skills & conduct; communication; self-care; interpersonal relationships; outreach, navigation & coordination; organization; advocacy; capacity building & teaching. The CHW training is facilitated by an instructor and provides a certificate upon completion. *A trainee must be sponsored by an employer prior to beginning the training, as the 25-hour Supervised Experience is required to complete the course. An employer must formally sponsor a trainee prior to the start of the training. It is vital that the employer has the resources necessary for the trainee to meet the Supervised Experience required activities. The CHW “Manual for Supervised Experience” is available for sponsoring Facilities/Agencies, Instructors, and Preceptors. Scholarships to cover the cost of the training are available through the BHWET grant funded by HRSA. The host facility will pay the participant’s training cost upfront and then would be reimbursed upon the participant’s completion of the training. All trainees must be sponsored by an employer, as 25 hours of supervised experience are required to complete the training. If needed, completion of a Computer Literacy Assessment & Training. Employers may have additional requirements (talk to your employer). The cost of the training is $1,500 per participant. Training fees are due at enrollment. Scholarships to cover the training cost are available upon successful completion of the training. Heidi Blossom, MSN, RN, worked in developing the Community Health Worker training program. Ms. Blossom has taught as an adjunct Professor of Nursing at Carroll College, in Helena, Montana, and has developed curriculum for nursing students as well as education majors. She collaborated with the Robert Wood Johnson Foundation Executive Nurse Fellows program to develop a guide for Community Health Workers, “Building a Community Health Worker Program.” She holds a BA in Nursing from Carroll College, Helena, MT, and an MSN from Gonzaga University, Spokane, WA, in Nursing Education. To register, please fill out the form found here.